This is another old favorite! First created in 1994, this little one was developed from one of Tony’s original sketches or “scribbles” as she likes to call them. A Baby Dragon emerges from an egg and looks around for her Mother, or perhaps a snack! Her little wings are emerging from the shell for the first time, still wet from the egg and not fully stretched out. and an eye that looks like it may move at any moment. This is part of the Dragon Collection from Amulets by Merlin which includes the Song Dragon, the Flame Dragon and Mirth Dragon. The over all “look” of these dragons are nether considered “Western” with the blocky faces and broad bodies, nor the “Eastern” dragons with the nearly serpentine bodies and trailing whiskers. The Tony Dragons are unique in their look and feel, as if there were actual dragons posing for the renderings and sculpture. 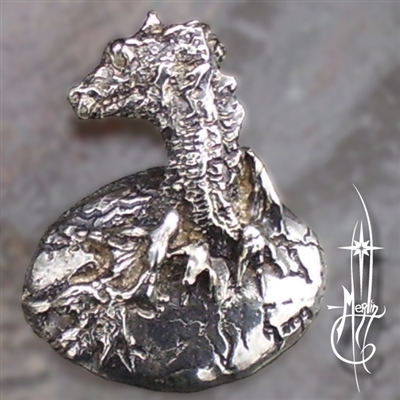 This Little One is perfect to add to your collection of Dragon pieces, excellent for the child in your life or the child within, hatching out from the shell of the mundane world.